Since we posted the review of the Panasonic PT-AX200, many have been asking how it stacks up against the formidable Sanyo PLV-Z5. Both of these models are 720p resolution LCD projectors and they are selling for similar prices, so putting them side by side for a test makes perfect sense. The Panasonic PT-AX200 (review here) is an upgrade to last year's model, the AX100. Sporting a brightness rating of 2000 ANSI lumens and some new features, the AX200 is an excellent option for those who cannot or simply don't want to create a completely darkened room for their projector. The Sanyo PLV-Z5 (review here) is the last in a long line of successful 720p LCD projectors from Sanyo, famous for their placement flexibility, excellent image quality, and reasonable pricing. Designed for traditional dark room home theater, the Z5 continues to be a contender in the 720p market a year after its release. There is no universal "best" projector that will fit everyone's needs, so there is no clear winner in this shootout. These are two excellent projectors with outstanding performance and features, but they are designed for different uses and environments. The Sanyo Z5 is excellent for dark room home theater, while the AX200 is a wonderful choice for console gaming, HDTV, sports, and other home entertainment applications where there is higher ambient light in the room. Please keep in mind that many of the differences listed here are subtle, and only visible in side-by-side testing. These two projectors are outstanding, and we list the subtle differences for completeness' sake. 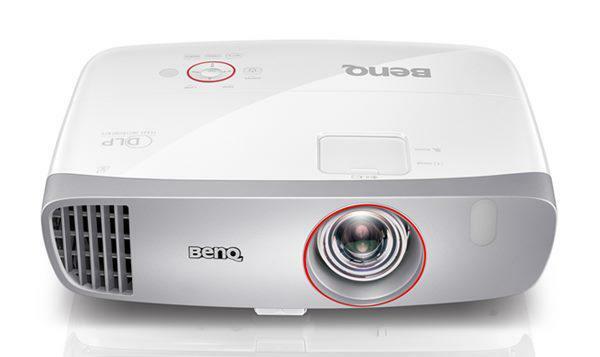 And the bottom line, as always, is that the best projector for you is the one that looks best to your eyes. Brightness: The Panasonic AX200 dominates this category. Lumen output on the AX200U runs from a maximum of 1845 ANSI lumens down to a minimum of 257 ANSI lumens. Meanwhile, the Sanyo PLV-Z5 runs to a maximum of 780 ANSI and a minimum of 180 ANSI, which makes the AX200 about 2.4 times as bright as the Sanyo Z5 in the projectors' brightest modes. Furthermore, the AX200's "Light Harmonizer" technology can adjust lumen output and gamma automatically to compensate for ambient light. If your viewing environment has any significant amount of ambient light, the AX200's extra lumen output could come in handy. Contrast: The PLV-Z5 is rated at 10,000:1 contrast, while the Panasonic AX200 is rated at 6000:1. While manufacturer's specifications and reality are often two very different things, the Z5 is clearly and definitively higher in contrast than the AX200 in side-by-side tests. This translates to deeper blacks, better shadow detail, and a more impressive image in a darkened room. Digital Noise: When placed side-by-side with a standard definition picture, there was a visible difference in picture noise between the two projectors. Even with both noise reduction filters turned on, the Z5 produced a cleaner, more noise-free image than the AX200. When using high definition content, the two were nearly identical, with noise levels being extremely low. Image Sharpness/Clarity: While we won't speculate as to the cause, the Z5 has a sharper image than the AX200. Part of this has to do with the higher contrast of the Z5, which does give the impression of a sharper picture - but this does not account for the whole difference. The bottom line is that the Z5 will provide a sharper, clearer, more precise picture than the AX200. Visible Pixelation: In our review of the AX200, we called it the "Poor Man's 1080p" due to the near-invisible pixel structure and its exceptionally clean compression of high definition material. While the Sanyo Z5 is a sharper machine, it also has a more visible pixel structure, which disappears when sitting more than 1.4 times the screen width from the projected image. The Panasonic AX200, meanwhile, has no visible pixels to speak of, even when standing with your nose to the screen. Lens shift: Vertical lens shift on the PLV-Z5 has a range of approximately three full screen heights. The AX200 has a slightly smaller range of about 2.5 screen heights. While this won't make a difference to most people, it could mean the difference between a simple installation and a more complicated one if you are planning to ceiling mount the projector. That extra edge in vertical shift may eliminate the need to include a drop tube from the ceiling. Audible noise/Heat exhaust: The Panasonic AX200 uses a higher wattage lamp than the Z5 to provide its substantial lumen output (220 watts to 145 watts respectively). This means that the fan must be more powerful to disperse the incremental heat. As such, the Sanyo PLV-Z5 is not only quieter than the AX200, but it also throws off less heat, which can be a factor to consider when using the projector in a small room. The Panasonic PT-AX200U has a couple of key benefits. It is by far the brighter of the two, which makes it the clear choice for anyone who prefer to have some ambient light in the viewing room. It also has a virtually nonexistent pixel structure, making it a great choice for watching HD DVD, Blu-Ray, or HDTV content without spending the big bucks on a 1080p projector. Meanwhile, the Sanyo Z5 continues to fill an important niche in the 720p projector market - it is a flexible, easy to install projector that is absolutely ideal for dark room theater. Superb contrast, a razor-sharp image, and almost zero audible noise combine to make the Z5 a great choice for a dedicated theater.